Although we haven’t been very active on our blog or our Twitter, we have been pretty busy these past few months, both in and out of the lab (mostly out of the lab during the month of January, because the government shutdown closed our lab for most of that month, along with the rest of the Smithsonian). In this post we’ll discuss some of the things we’ve been working on recently. Happy faces upon our return to the lab at the end of January. Selfie by Lotte Govaerts. The cataloging work on the 39BF2 (Medicine Crow) collection continues, though the project was unavoidably on hold during the shutdown. Since our last update on that work, Lotte has finished numbering the Archaic components and moved on to other Plains Village components of the collection, which include a variety of ceramic, lithic, and bone artifact types as well as some metal. We will be posting more updates on the 39BF2 project as the work progresses. Aside from cataloging, Lotte has been working on her dissertation, as well as several manuscripts which are in various stages of publication. So far only one of those has been published: a short review of Michael M. Casler and W. Raymond Wood’s “Fort Tecumseh and Fort Pierre Chouteau: Journal and Letter Books 1830 – 1850, which appeared in North Dakota History Vol. 83, issue 2. We will share information on the other publications once they are in print as well. Additionally, she presented on her thesis research at two conferences. Most recently at the Society for Historical Archaeology’s annual meeting, which was held in St. Charles, Missouri in early January. A few months before that, she spoke at the 2018 National Fur Trade Symposium. This meeting, hosted by the Northern Plains Heritage Foundation, the Lewis and Clark Fort Mandan Foundation, and the State Historical Society of North Dakota, took place in late September in Bismarck, North Dakota. The National Fur Trade Symposium is a triennial event where fur trade historians, archaeologists, and other scholars gather. The event is held at various locations across the West. It includes research presentations, field trips to fur trade-related sites, and living history demonstrations. Lotte Govaerts speaking at the 2018 National Fur Trade Symposium. Photo credit: Northern Plains National Heritage Area, North Dakota. Dan, meanwhile, has been busy writing his book. The book’s working title is In the Age of Empires. Over the last three months he has drafted sections on the Natchez, Arikara (Sanish), and Pecos Pueblo. While on an extended stay in Santa Fe (Dan is retired now) he was able to consult with experts on the archaeology and history of Pecos Pueblo. The ruins of the church at Pecos National Historical Park. Photo credit: Dan Rogers. The three newly drafted sections of the book are part of a larger case study about European expansion into North America. Next up for the book project is the fascinating story of the Aztec Empire’s encounter with Cortez and his expedition. Dan directed excavations at Aztec-era sites in the Toluca Valley back in the 1990s. He has plenty of material to draw on for this chapter of the book. Stay tuned for more updates on the book project. Casler, Michael M., and W. Raymond Wood, eds. Fort Tecumseh and Fort Pierre Chouteau: Journal and Letter Books, 1830 - 1850. South Dakota Historical Society Press, 2017. Govaerts, Lotte E., Review of Fort Tecumseh and Fort Pierre Chouteau: Journal and Letter Books, 1830 - 1850, by Michael M. Casler and W. Raymond Wood. North Dakota History 83(2), 2018. The 2016 Academy Awards ceremony is now behind us. It took place this past Sunday, February 28, and The Revenant won three awards: Best cinematography (Emmanuel Lubezki), best director (Alejandro Iñárritu), and best actor in a leading role (Leonardo DiCaprio). This is a good time to share the next blog post in our series on the real stories behind The Revenant. In this installment we explore the history of the Ashley-Henry expedition, which the real Hugh Glass participated in. The events The Revenant is based on took place in the second year of William H. Ashley’s foray in the fur trade business. The real history of this business venture is quite interesting. These early years of the venture are often referred to as the “Ashley-Henry expedition”, or “Ashley’s Hundred”. The company would later morph into the Rocky Mountain Fur Company (see Chittenden 1902, p. 247-308; Berry 1966; Dolin 2010, p. 223-255). William Henry Ashley (1780-1838) was an entrepreneur in the Louisiana Territory in the early days of its existence as a United States territory. He made some money in real estate and manufacturing, and during the war of 1812 joined the Missouri Militia where he earned the rank of Brigadier General. He also had an interest in politics and was elected the first lieutenant governor of the newly admitted state of Missouri in 1820. Not all of Ashley’s ventures were profitable, and he was in financial trouble by the early 1820s. To fund his further political ambitions, Ashley decided to try his luck in the fur trade business, which was quite lucrative at the time. Beaver hats were the height of fashion in Europe, driving massive demand for furs. In early 1822, Ashley joined forces with a previous business partner, Andrew Henry (~1775-1832). Henry already had experience in the fur trade, as one of the founders of the Missouri Fur Company, along with Manuel Lisa, Jean Pierre Chouteau, William Clark and others in 1809. Henry had also joined the Missouri Militia, and earned the rank of Major (the character in The Revenant played by Domnhall Gleeson is Captain Andrew Henry). Figure 2: “Double spring, wrought iron animal trap likely used to trap beaver around 1810-1830 or earlier. Baited with the musk oil of beaver, the trap would have been set in bodies of water near beaver dams. The weights on the base of the trap served to anchor it underwater, resulting in the demise of the trapped animal.” This trap is curated by our colleagues at the National Museum of American History. Image and description via Smithsonian Collections Search Center. The fur trade in the Upper Missouri River basin was dominated by the Missouri Fur Company at the time (a company that had already dissolved and reorganized a few times). Rather than directly compete with the Missouri Fur Company, Ashley decided to employ different methods. The fur trade establishments on the upper Missouri did business by trading with local (and not so local) tribes. They employed a few hunters/trappers directly, but most of their furs and skins were obtained through the trade. Ashley instead decided to send men out to obtain furs directly by hunting and trapping. The men would be paid in furs, keeping half of what they collected as payment. According the Chittenden (1902, p. 262), the first recorded licenses for trade on the upper Missouri obtained by Ashley and Henry were dated April 11, 1822. Having received ample response to their advertisement, mainly from young men, the expedition commanded by Henry set out from St. Louis in two keelboats full of supplies and merchandise, on April 15, 1822. The plan was to ascend up the Missouri to the headwaters, a region believed to be extremely rich in fur-bearing animals. They intended to stay there for three years, trapping along the streams of the region, and possibly exploring as far as the mouth of the Columbia River (Chittenden 1902, p. 263). Figure 3: Some of the men employed by William Ashley became rather well-known in their own right. The covers of the many volumes dedicated to the mountain fur trade and its famous trappers often feature drawings of these men engaged in fur trapping or hunting activities. These “mountain men” are almost always pictured with their long rifles, which became a sort of symbol for the mountain fur trade. The so-called “Kentucky long rifle” (or Pennsylvania long rifle) was in use throughout the 18th century, the barrel becoming shorter by the early 19th century. The barrels were made shorter still for rifles specifically designed for the mountain fur trade in the early to mid-19th century. The Hawken rife, manufactured in St. Louis, is a famous model associated with the fur trade. Some later models had percussion caps rather than flintlock mechanisms. For more information on firearms, see Russell 1980. Covers pictured are Chittenden 1902 (1986 reprint), Barbour 2011, Dale 1991, Morgan 1953, Sullivan 1992, Sunder 1959. Source: Google Books/Amazon. The first setback was encountered early in the expedition, when one of the party’s two keelboats was lost after getting snagged (a very common problem on the Upper Missouri). The crew was saved, but some $10,000 worth of property was lost. The next setback was encountered in August. The expedition had acquired horses by this point, and a land party walked along the river with said horses, while the rest of the party traveled by boat. All of the horses were stolen by a group of Assiniboine. The loss of the horses prevented the expedition from carrying out their plan of traveling all the way up the Missouri that same summer, and establishing a fort near the headwaters. Instead, they set up a fort at the mouth of the Yellowstone, where they spent the winter hunting and trapping. Henry managed to purchase more horses that winter, and set out for Blackfoot Country early the next spring. The details of that part of the expedition are sketchy, other than that Henry’s party was attacked by a group of Blackfeet, and subsequently driven out of their area. He returned to mouth of the Yellowstone in June 1823. Figure 4: Smoothbore flintlock muskets like the one pictured here were another common firearm in the 1820s fur trade. These were produced in large quantities for the Indian trade. They were traded as well as used by the traders/trappers. This particular .60 caliber smoothbore flintlock musket was manufactured in Pennsylvania around 1820. The lockplate, stamped "Ketland & Co." and "UNITED STATES" was manufactured in Britain for use by U.S. military contract manufacturers. Curated at the National Museum of American History. Image and description via Smithsonian Collections Search Center. Back in St. Louis meanwhile, Ashley had put out more ads in local papers, recruiting another one hundred or so men for his venture. He accompanied this part of the expedition himself and left St. Louis with another two keelboats on March 10. He progressed up the river without incident, until he reached the Arikara (Sahnish) villages on May 30th. Ashley anchored his keelboats well out in the water, and went ashore with two men, where he met with some of the chiefs and expressed a desire to trade. Ashley proposed to meet them on the sand beach, where details of the trade could be arranged. The chiefs agreed, and the meeting took place as planned. Ashley gave out presents, and a price for the horses was agreed upon. Everything seemed to be going well. On June 1st, preparations were completed, and Ashley intended to set out the next morning. Another meeting with a chief occurred that evening. Still everything seemed to go well, although Ashley’s translator warned him there might be trouble brewing. Ashley apparently ignored the warning and left the boats moored near the villages for the night, while the land party camped on the beach. Ashley apparently was awakened very early in the morning of July 2, with the information that one of his men had been killed, and an attack on his party was imminent. Indeed, at dawn, Arikara warriors from the villages opened fire from an extremely well-defended position. They mainly fired at the land party on the beach, who took heavy casualties. Ashley, on one of the keelboats, attempted to get the boats to shore to take on the men, but the boatmen refused to go near the shore. Eventually some men were picked up by skiffs, and others attempted to swim. Several drowned. The keelboats were cut loose and drifted downstream to a location out of reach of the villages, where the crews went ashore. Ashley made a list of those wounded in the fight. Hugh Glass was among them (Dale 1991, p. 71)2. These events are likely the basis for the battle scene early in The Revenant, although that battle did not appear to be taking place near the villages. Ashley meant to make another attempt to pass the villages, but the majority of his men refused to do so until they received some reinforcements. Thus, Ashley descended the river another twenty-five miles, and dug in there, with some 30 men who agreed to stay on. He transferred most of his supplies to one of the keelboats, and sent the other one back downstream with the wounded, and those men who did not want to stay. Ashley sent word to Major O’Fallon, the Indian Agent, and to Colonel Leavenworth, commanding officer at Fort Atkinson, to ask for government assistance. Ashley also sent word to Henry, who descended the river with most of the men from their fort at the Yellowstone and joined Ashley near the mouth of the Cheyenne in early July (Henry’s party traveled down the river and passed the Grand River villages without incident). He brought the furs collected while up at the Yellowstone, and sent those downriver to St. Louis. Ashley and Henry were uncertain whether help was coming, and decided to go further down the river and try to acquire horses there. They were successful in this endeavor, and went on to a nearby fur trade post, where they learned that troops were indeed coming to confront the Arikara. After the conclusion of the Leavenworth campaign (as described in the previous blog post), Ashley sent Henry and some 80 men overland to the Yellowstone River. It was on this leg of the journey that Hugh Glass had his unfortunate encounter with a grizzly bear3 . Henry experienced a few more setbacks on that journey, including the discovery, upon his return to the Yellowstone fort that many of the horses left there had been stolen by groups of Blackfeet and/or Assiniboine. Several more were stolen after his return to the post, and he decided to abandon that location and move up the Yellowstone. Figure 6: The Anthropology collections here at the National Museum of Natural History also include some intact 19th century firearms (see Smithsonian Collections Search Center), however these do not come from archaeological contexts. Although it is possible for a firearm to survive the elements for over a century if conditions are just right (see Brumfield 2015), this is extremely rare. In archaeological contexts, we more typically find firearm-related objects or gun parts. Lead balls, along with molds and sprue (lead ball manufacturing byproduct) are common finds on historic period sites, as are shell casings on later sites. These particular lead balls are from 39ST202, “Fort George”, an Upper Missouri fur trade post established some two decades after the events pictured in The Revenant. Henry managed to purchase more horses from a group of Crow near the Powder River, and divided up his men into a group that was sent to the southwest, and a group that he accompanied to the mouth of the Bighorn River, where he erected a post. The former party found themselves in the Green River Valley that autumn, which they discovered to be extremely rich in fur-bearing animals. Around this time, Andrew Henry left the Ashley venture. Things weren’t going extremely well for William Ashley during this period. His credit was depleted, and he had lost his bid for Governor of Missouri. However, his luck would soon turn. The later history of the Ashley venture is possibly even more well-known than its early history (See Dolin 2010 p. 225-254). When Ashley received the news about the furs from the Green River Valley, which reached him in the summer of 1824, he decided to give up on the Missouri River altogether, and focus his business on the Rocky Mountains exclusively. Figure 7 Another common find on historic sites are gunflints. These particular specimens are from 39ST202, Fort George Trading Post. For more information on the archaeological study of gunflints, see Kenmotsu 1990. Later that year, Ashley led a supply train and 25 men from Fort Atkinson to the Green River Valley, where they arrived in April 1825. He split his men into small groups to do their trapping, and told them to rendezvous in July at a yet-to-be-determined location along the Green River, which they would find based on the markers he would leave for them. The rendezvous took place as planned on July 1st, and included approximately 120 trappers (including some who had defected from the Hudson’s Bay Company). Ashley resupplied the men and collected their furs. He headed back on July 2nd with a small group of men, leaving most of the men behind in the mountains to continue trapping. The venture was very successful and Ashley led another supply train into the mountains the next summer, for a second rendezvous, which was even more profitable. Ashley not only got out of debt, but became wealthy. He sold his interest in the company to three of his trappers: Jedediah Smith, David Jackson, and William Sublette. He continued to supply trade goods to his former company, but mostly focused his attention on his career in politics. He won a congress seat in 1831, which he held for two additional terms. Figure 8: Assorted gun parts4 from historic period archaeological sites in North and South Dakota, excavated during the River Basin Surveys, curated at the National Museum of Natural History. For an example of an archaeological study based on gun parts, see Bleed and Watson 1991. To see other artifacts in the Smithsonian collections, see Smithsonian Collections Search Center. Although Ashley’s actual involvement in the fur trade was brief, his name is well-known in fur trade history, because of the way his business model revolutionized the fur trade. He introduced the rendezvous system that became a fixture of the Rocky Mountain fur trade until 1840. Each year, hundreds gathered at these rendezvous, including the trappers and fur company employees, as well as native people looking to trade. These gatherings lasted several days or weeks. The men who stayed in the mountains year round became known as “mountain men”, who captured the nation’s imagination and became well-known figures in the mythology of the American West, but that is a topic for another time. Ultimately Smith, Jackson, and Sublette sold Ashley’s company to Thomas Fitzpatrick, Jim Bridger, Milton Sublette, Henry Fraeb, and Jean Baptiste Gervais in 1830. These men continued the business under the name “Rocky Mountain Fur Company”. However, the fur trade was in decline in the 1830s. Extreme competition and overhunting lead to depletion of beaver populations. This coincided with a change in fashion in Europe, where silk hats were replacing the beaver fur models. The five partners of the Rocky Mountain Fur Company sold their interests in 1834, and the company was absorbed by the American Fur Company. Hunting and trapping for furs was the impetus that brought Hugh Glass and the rest of the Ashley hundred into the Missouri River Basin, setting the stage for the events depicted in the Revenant. Although the fur trade was not central to the movie’s main storyline, it was a huge part of the US economy at the time and it paved the way for the westward expansion of the nation. In the next blog installment we will discuss fort Kiowa, the fur trade outpost shown in the film. Such forts were critical to the colonial expansion of the US. Barbour, Barton H. Jedediah Smith: No Ordinary Mountain Man. University of Oklahoma Press, 2011. Berry, Don. A Majority of Scoundrels: An Informal History of the Rocky Mountain Fur Company. Harper, 1961. Bleed, Peter, and Daniel Watson. “Frontier Flintlocks: A Fault Tree Analysis of Firearm Use at Contact Period Sites of the Great Plains.” Great Plains Research 1, no. 2 (1991): 233–48. Brumfield, Ben. “A 132-Year-Old Rife Found Propped against Nevada Tree.” CNN. Accessed March 2, 2016. http://www.cnn.com/2015/01/15/us/nevada-century-old-rifle-park/index.html. Chittenden, Hiram M. The American Fur Trade of the Far West. New York: Francis P. Harper, 1902. Dale, Harrison Clifford. The Explorations of William H. Ashley and Jedediah Smith, 1822-1829. Lincoln: University of Nebraska Press, 1991. Dolin, Eric Jay. Fur, Fortune, and Empire: The Epic History of the Fur Trade in America. W. W. Norton & Company, 2011. Kenmotsu, Nancy. “Gunflints: A Study.” Historical Archaeology 24, no. 2 (1990): 92–124. Landry, Clay. “Primary Sources - The Real Story of Hugh Glass.” The Real Story of Hugh Glass. Accessed March 2, 2016. http://hughglass.org/sources/. Morgan, Dale Lowell. Jedediah Smith and the Opening of the West. U of Nebraska Press, 1953. Nester, William R. The Arikara War: The First Plains Indian War, 1823. Mountain Press Pub. Co., 2001. Nichols, Roger L. “Backdrop for Disaster: Causes of the Arikara War of 1823.” South Dakota History 14 (1984): 93–113. Nichols, Roger L. Warrior Nations: The United States and Indian Peoples. University of Oklahoma Press, 2013. Russell, Carl Parcher. Guns on the Early Frontiers: A History of Firearms from Colonial Times Through the Years of the Western Fur Trade. University of Nebraska Press, 1980. Sullivan, Maurice S. The Travels of Jedediah Smith: A Documentary Outline Including the Journal of the Great American Pathfinder. University of Nebraska Press, 1992. Sunder, John Edward. Bill Sublette: Mountain Man. University of Oklahoma Press, 1959. The Maya didn’t just collapse, and neither did the other societies mentioned in my previous post about Jared Diamond’s book Collapse. The idea of collapse was a long-standing belief held by many scholars, but it just doesn’t make sense. Entire societies don’t just fall to pieces and vanish overnight, particularly ones that reach such high levels of sophistication. In fact, there are still Mayan people living in the same jungle regions, speaking the same languages, and carrying on similar traditions as their ancestors. The Maya didn’t disappear, leaving behind only ghostly pyramids covered in vines to show where they had been. In reality, they never even really left. Instead, they adapted to changes that were causing difficulties for their society and found a new way to live in the region. No one knows exactly what caused the shift away from cities full of monumental architecture, but many suggestions have been put forward. 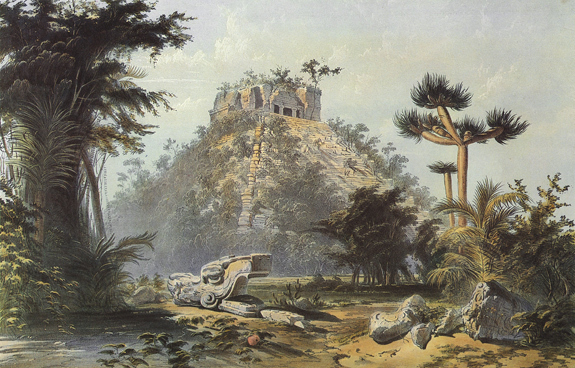 Frederick Catherwood painting of the Pyramid of Kulkulcán in the Maya city of Chichén Itzá. (From the online archive of lithographs at the Frederick Catherwood House, Plate 22). One of the most popular suggestions involves a drastic change in the climate of the region, specifically, a drought. There are, of course, many other theories involving everything from political mismanagement, and a souring of trade relations, to widespread war over resources and social turmoil. The mystery of what caused the Maya to move away from their cities may never be solved; but there are many other interesting aspects of the change in their society to consider. Among these, what mechanism allowed them to carry their language and culture to the present day, in the face of whatever changes forced the abandonment of their cities? Modern day murals in Honduras depict traditional cultural elements of Mayan Ancestors. The answer to that question is resilience in the face of change and quick adaptations. The Maya left their cities, instead choosing to live in smaller units, like towns or villages, which are still the social structure of the Maya people today. This move to a different organization technique allowed their society to absorb the stress of change and still maintain central elements of the culture, despite a structural shift. The ability to absorb the changes and reorganize into a new structure while still maintaining the original identity of the culture or system is called resilience and it plays a critical role in how social systems function over time. Figure 1: General view of a resilient system and how the initial, current, and additional states are altered through resilience. A resilient society will be made up of various interacting parts, which encourage “persistence, adaptiveness, variability, and unpredictability” within the overall structure of the organizational system (Gunderson & Holling, 2002: 27-28). This is referred to as “ecosystem resilience” and is best applied when dealing with a great deal of uncertainty. It also emphasizes understanding how much change can be absorbed into a system before the overall structure is altered. A resilient system can incorporate stresses into its structure without losing its stable or current state. In terms of a society, like the Maya, the organizational structure generally starts out as being one with fairly equal parts spread out over an area. As time passes, those parts (like villages or towns) unite into a more formalized group, with a central organizational point in one place. Eventually, this point or town grows in size (becoming a city) and holds more centralized power over the other, smaller towns that make up the system. Once power is centralized, certain stresses on the system as a whole are harder to handle because the resources are no longer spread around and immediately accessible by all the parts of the system. If a unified society is resilient, they can react accordingly to a change in their society or environment, using their centralized power structure as an advantage. The Mayan civilization was unified for more than one thousand years, suggesting that they were fairly resilient for quite some time. Much like the eventual weakening and final separation of the Mayan civilization, a system won’t always be strong enough to absorb changes like war, social unrest, or drought. Eventually, even a resilient system will lose its level of resilience and reach its threshold. This threshold is a tipping point, where the stress on the system can no longer be absorbed into the system without leading to change. The Maya reached their threshold during the final century of the Classic Period (AD 250 -900). Their resilience was no longer high enough to over-power stresses, and Mayan society was pushed over the threshold. An “additional state” (a new equilibrium – see Figure 1), became the new normal, and the Post-Classic Period began. Up to this point, Mayan society had been resilient enough to shape their cities from a wild jungle and establish vast trade networks across the region. Their resilience had allowed them to build up complex government and a recognizable social system, but nothing stays the same and change happens. Modern people look at the end of the Classic period in Mayan history as a fall from power, a collapse, but is this really the case? Is the move over a threshold into a different state always a bad thing, or is that shift really an integral part of all systems, even social ones? Our own society has plunged into what has been termed the “Great Recession,” and it affects every part of our culture. Does that mean we, like the Mayans and the Romans, are collapsing, or is it just a symptom of changes in our stable state? Diamond, Jared M. Collapse: How Societies Choose to Fail or Succeed. New York: Viking Press, 2005. Gunderson, Lance H. and C.S. Holling, Eds. Panarchy: Understanding Transformations in Human and Natural Systems. Washington: Island Press, 2002. As 2012 draws to a close, many people are asking if there will be a year 2013, or even a December 22nd, 2012. Thanks to the proliferation of modern media, most of America, if not the world, has been made aware of the Mayan calendar coming to an end on December 21st of this year. There are numerous projections for what might happen when the calendar reaches its end, from a world-wide collapse of societies, to an apocalypse brought on by epic natural disasters. The idea of societal collapse and end of days is a fairly popular topic beyond just the Maya. Post-apocalyptic movies like 2012 and a variety of TV shows with similar themes, like Revolution or Doomsday Preppers, are now dominating our screens. Screenshot from the movie, 2012. All Rights Reserved by Sony Pictures. Source: Sony Pictures, 2012 Official Movie Site. Is all of this concern stemming from the end of an ancient calendar, or is there something more motivating this fear and preparation for a post-apocalyptic world? If you look carefully at the issues often brought up in TV and movies, they are tied to real world problems. Though the idea of the whole planet being swept away in one massive flood is a bit over-dramatic, to say the least, Hollywood is tapping into real-world concerns dealing with rising sea level and climate change. These issues have been around for quite awhile, but public awareness and concern appears to have gained momentum in the past decade, with increased research into climate change and a great deal of media coverage in general. Figure 1. The final section of Tortuguero Monument 6. See Figure 4 for a general overview of the text's original form. (Drawing by D. Stuart). Source: Maya Decipherment. This media isn’t restricted to TV and movies; a proliferate number of magazine articles and books dealing with climate change and consequences are being written every day. A particularly popular book in this category is Collapse: How Societies Choose to Fail or Succeed, by Pulitzer Prize-winning* author, Jared Diamond. He is a physiologist by training, but has since become skilled in several other fields of study, including anthropology, biology, geography, and history among others. The book was published in 2005 and stems from several earlier talks he gave on college campuses around the country. Diamond’s theory evolved from these early talks where the five main areas of a collapse framework consist of human impact on the environment, climate change, friendly trade partners, interactions with enemies, and a society’s response to environmental changes. This final element is considered the most critical aspect to discovering why a society fails or succeeds and can be broken into twelve key factors: destruction of natural habitats, reduction of wild foods, loss of biodiversity, soil erosion, depletion of natural resources, pollution of freshwater, maximizing natural photosynthetic resources, introduction of toxins and alien species, artificially induced climate change, and overpopulation. Diamond supports his thesis by including twelve case studies of past and present societies that he claims decided either to fail or succeed in large part because of environmental stresses and changes. Cover Photo. Diamond, Jared M. Collapse: How Societies Choose to Fail or Succeed. New York: Viking Press, 2005. The issues surrounding climate change and what could potentially happen to societies are very popular topics. While not all scholars agree with Diamond’s analysis of the factors that contribute to societal collapse, many do appreciate how he has brought the issue to a wider audience. One such group of individuals was originally brought together to serve as a panel of experts (each specialized in one of the societies that Diamond discusses) at an American Anthropological Association symposium. The panel discussions grew into an edited, thirteen chapter volume, Questioning Collapse: Human Resilience, Ecological Vulnerability, and the Aftermath of Empire. These authors, and many others with specialties in particular cultures, ecology, or history have taken large portions of Diamond’s argument and found substantial evidence countering his theory about environmental determinism and that groups choose to fail or succeed. I have been reading up on the issue of societal collapse over the past couple of months in order to make use of the information when working with the computational agent-based models that are part of the Mason- Smithsonian NSF Grant. One of the main goals of the grant is to provide a fuller understanding of climate- society dynamics and the best way to build this knowledge is to start with past data about societies that have dealt with complicated socio-climate situations. Past societies or cultures like the Maya, Easter Islanders, or Greenland Norse are often described in literature, like Diamond’s, as having “collapsed” due to the stress placed on them by climate changes. While Diamond raises some critical issues, many authors dealing with the same material have suggested that instead of calling the myriad of situations he identifies as “collapses,” a different theoretical label needs to be applied. None of these societies just fell apart as the word collapse suggests. They did suffer significant losses in the general population at particular times in their past, often due, in part, to environmental stressors. Cover Photo. McAnany, Patricia and Norman Yoffee, eds. Questioning Collapse: Human Resilience, Ecological Vulnerability, and the Aftermath of Empire. New York: Cambridge University Press, 2010. The scholars that wrote the critique of Diamond’s book “Collapse,” proposed that instead of labeling these situations as societal collapses or chosen failures, they should be considered in terms of resilience. It would be more accurate to describe these past societies as people who faced drastic changes in the environment, and found ways to adapt quickly. This would be referred to as resilience, or the ability of a particular ecosystem to absorb disturbances and continue to function in the same general form as before. Many of the factors that Diamond points out are real issues in terms of changing climate, but the result of these changes isn’t an all-out collapse. Instead, the societies that faced these problems developed extreme adaptations in order to stay resilient, and where that failed, they moved on to better environments that could support the structure they had developed. McAnany, Patricia and Norman Yoffee, eds. Questioning Collapse: Human Resilience, Ecological Vulnerability, and the Aftermath of Empire. New York: Cambridge University Press, 2010. Sony Pictures Digital, Inc.. "Backgrounds Home 1." Photograph. Webshots. 2012 Official Movie Site. Sony Pictures Digital, Inc., 2009. Web. Nov. 2012. Stuart, David. 2011. More on Tortuguero’s Monument 6 and the Prophecy That Wasn’t. Wordpress Blog. Maya Decipherment: A Weblog on the Ancient Maya Script. October 4.